The game RENDERS at about 40fps, which is fine, but the players move at about 3 FPS. I'm certain it's not a framerate issue as I can still look around and it runs at a buttery 45 FPS at all times regardless, but all the other players jolt, it's like they freeze, then skip forward, then freeze, then skip forward. It makes it really hard to enjoy combat. It happens with enemies, and teammates. it's almost as if there's really high packet loss or something. It happens constantly about every half a second. Voice chat is also distorted and choppy in the game, but not in discord. And as far as I can tell, no other games are affected. They are all buttery smooth networking, but not Apex Legends. It's a nightmare to play. The enemy stops & starts so much I can't fight. I'm on a wired network connection. That packet loss percentage should have gave it away. It wasn't an issue with Apex Legends. When I finally saw it in another game I knew. Pings may not show packet loss unless you send large pings! I had packet loss on my network that was invisible until I upped my ping packet size. (which was my routers & cable modem). One of the devices further down the chain had terrible packet loss (>60%) for large packets but 0% for small. I fixed it by restarting it but it could also be a cable or something internal that needs replacing. Not the answer you're looking for? 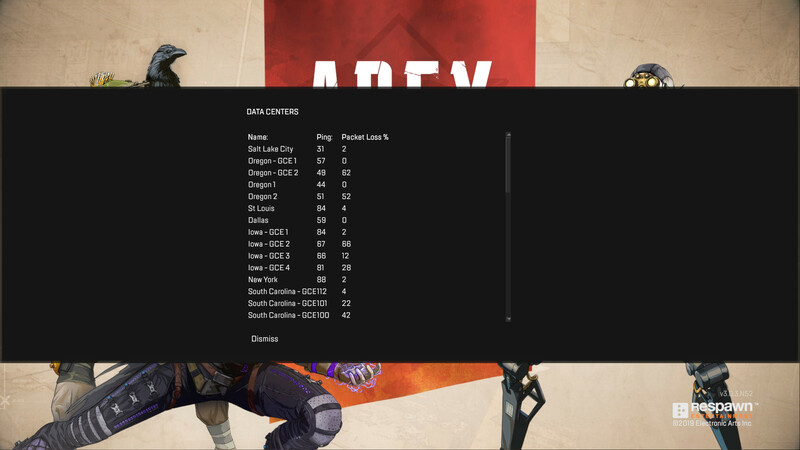 Browse other questions tagged networking performance apex-legends or ask your own question.